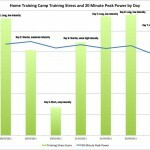 Dear Diary, I regret not filling you in during the off season, and while it was liberating to train without power the sense of inaccuracy surrounding my Performance Management Chart frustrates me. For the second year in a row my reduced motivation to train was matched by a reduced motivation to log when I trained. So if I turn to the diary for guidance during my early season lows I’m presented with blank pages; I could view it as a clean slate, but it leaves me unsettled. I know the value of historical records, they’ve served me well in the past, despite this I couldn’t be bothered. All is not lost, the data is out there, Garmin has ensured that. My Edge remembers everything from the last five months – it hasn’t been that much – and my Forerunner bleeps after every run, ‘Transferring Data’, a moment later it’s on Garmin Connect; even my swim sets – rare as they are – have been recorded, from Finis Swimsense to their online log. The implication of my winter laziness isn’t a break in the previously continuous record, but a few hours work to consolidate the data in one place. My concerns about health, performance and the inconsistent start of the season were enough to have me begin the process. Besides, for cycling I was up to date in a matter of minutes, allowing plenty of time for comparisons with the past. 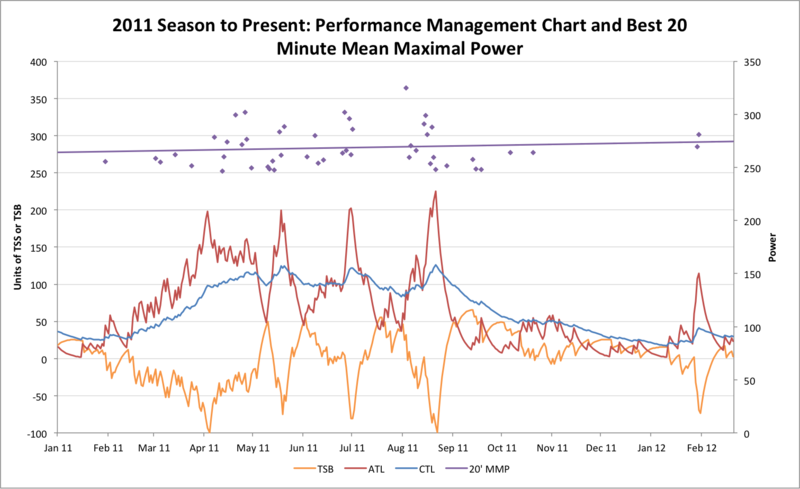 That lack of motivation to log or analyse my training means this is the first time I’ve produced a complete cycling Performance Management Chart for 2011. I had a strong sense of what went wrong and little desire to dig further, I’ve come to terms with that season now, but will save further comment for another time. What interests me is how the first two months of the year compared to the last – where is my fitness? How did my power compare? Not that different. Winter has been cruel to my CTL, once more bringing fitness to an early season low. See the jump at the end of January – the Lanzarote training camp takes effect, only for illness to follow; not quite the desired result, but it made a small contribution. Twenty minute mean maximal power could suggest I’m a little stronger now, the trend line heads ever-so-slightly up, I don’t read anything into that – the difference isn’t significant. My preferred method of training reflects the time I have available to train – I ride to feel on any given day; there is less structure in my sessions than I assign to others. It’s effectiveness can be questioned, but this is an approach I enjoy. 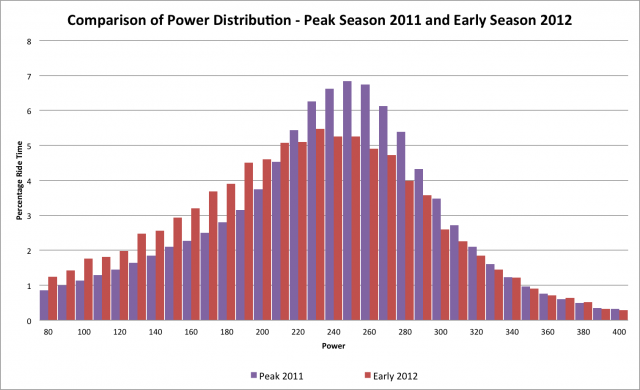 I closely follow my power distribution throughout a season – how hard am I riding and for how long – all being well I anticipate a gradual shift to the right, as fitness increases so does the wattage. The same comparison can be made between seasons to build a picture of how I am riding and where my power is. That shift to the right? 2012 is broader, more time is spent at higher wattage, but there is a less distinct peak around steady-state power; today’s ride would support this – variable power, attacking hills, few periods of consistent, steady cycling. I am certainly more willing to push, but whether this makes me a stronger cyclist (or a better rested one) is another question. I suspect – feel – that I’m stronger, or at least mentally primed to work harder, I also know I lack the endurance to back this up. 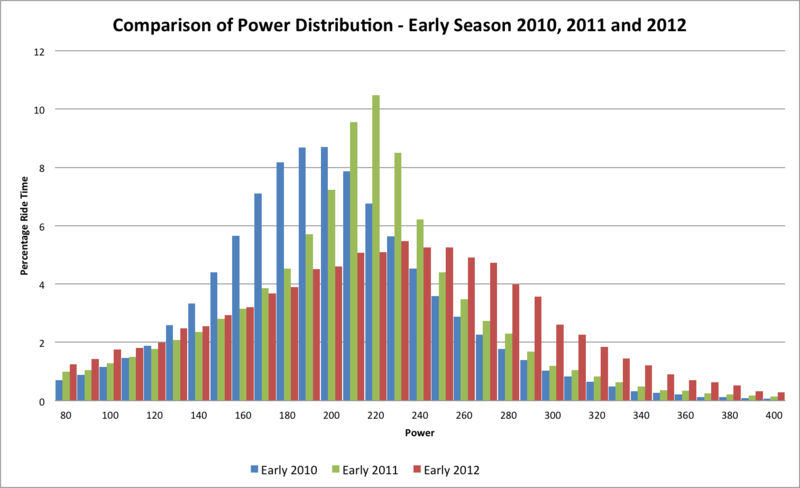 2010 was added out of curiosity, there was no early season – February, the month shown, was the transition from riding the length of New Zealand to racing its Ironman; total hours would have been higher and I ran a lot more, but it is interesting to see lower power numbers in training. Ironman New Zealand was a good result. I couldn’t resist comparing with my peak last year, August contained the best of the season’s riding, it was downhill after that. A little more focussed around the high two hundreds and a little less spread than my current efforts, reflecting the consistent steady-state efforts I could hold; I can push the same numbers now, but they feel harder and I know that sustaining them in a comparable way is presently out of reach. At the same time the way I ride shares the same feel, perhaps all of last year’s work has put me in a better place. I suspect only time will tell. A few hours dipping into the diary provides some reassurance; no hard answers nor predictions, but I never expected to find that. Do these trawls through the past really help? At least I know my position is no worse than last year, which leaves the season open – whatever happens comes down to what I do next. It will take more than a quick comparison of a handful of rides to build the full picture, there’s more buried within that diary. I can learn from 2011 – the benefits of some steady riding early in the year, the problems of pushing myself through too many intensive training weeks and certainly the impact of protracted fitness loss on racing. The diary’s greatest value comes in telling me what not to do. From this point on, I’m recording everything, all in one place.